Next to the big choral works like the Mass in B minor or the St. John and St. Matthew Passions as well as his a-cappella motets, Johann Sebastian Bach’s over 200 preserved cantatas represent the corpus of his sacred choral and orchestral music. Written in an almost weekly cycle for every Sunday of the Christian year, their musical diversity and beauty is astounding. Among the cantatas, three are written for solo-bass, to which Michael Volle regularly lends his warm yet powerful voice in concerts all around Europe. 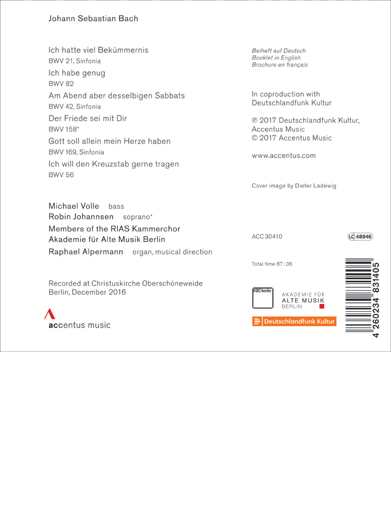 In December 2016, he recorded them at the Christuskirche Berlin, together with the Akademie für Alte Musik Berlin, one of the world’s leading orchestras specialized in historic performance.